A DRUNKEN father who was brandishing a knife at police officers used his own young baby as a shield when one of them tried to target him with a Taser. Warwick Crown Court heard that Anthony Keenan, who had already been Tasered once, to no effect, only calmed down enough to be arrested after an officer he knew turned up. Keenan (23) of Rangemoor, Willenhall, Coventry, was jailed for two years after being given a one-third discount for his early guilty plea to affray. Prosecutor Antonie Muller said Janine Finnie was Keenan’s partner at the time, and they had a six-week-old child with whom he was allowed only supervised contact. In December last year he visited Miss Finnie’s flat, and the plan was for him to return later with his mother to babysit while she went out. But when Keenan, who was described as an alcoholic, turned up late and drunk there was an incident between him and Miss Finnie who ran out and called the police. When officers arrived and went inside they found broken bottles and Christmas decorations on the floor in the living room. Keenan’s brother then came in recording the police on his phone, and was involved in a struggle with officers in the lounge when he was told to leave. They let go of his brother, who jumped out of a window, and pressed their emergency buttons as Keenan lunged at one of them with the knife. That officer drew his Taser and told Keenan to drop the knife and hand over the baby. 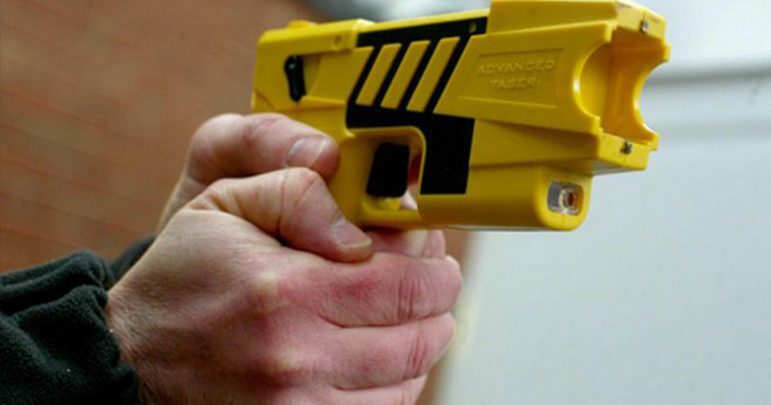 He lunged at the officer with the knife, but missed and the knife plunged into the wall – so the officer Tasered him, but it had little effect. And as the officer tried to aim the Taser, which shines a red dot on the targeted area, at him again Keenan began using the baby as a shield. Fortunately at that moment a policeman who knew Keenan then turned up, and he calmed down and handed over the baby, who was unharmed, said Mr Muller. Following his arrest Keenan claimed he had the knife in his hand because he was preparing food, and that he had only swung it to try to cut the Taser wires. Simon Rippon, defending, said that although the knife was raised during the incident, Keenan was not swinging it at the officers. Jailing Keenan, Judge Sylvia de Bertodano said it did not matter what happened which led to the police being called, but when they arrived he was in the kitchen holding the baby who became distressed by what followed. “You had had far too much to drink, and what happened which makes it much more serious is that you went into the living room with your child in one hand and an eight-inch kitchen knife in the other and were threatening towards the police. “When an officer drew his Taser and told you to drop the knife, you began to use your own baby as a shield to protect you. It is hard to imagine a more serious affray.